This time I have only 4 classes, 2 in Tokyo, 1 in Nagoya and 1 in Kyoto. On my off days I am taken sightseeing by my host or one of his helpers. It all goes by very fast. The classes are 10 am to 3 pm. In the mornings we stop at a local store to pick up a drink and box lunch on the way to class. The first thing I do is set up a display table with examples and variations of the class pattern. I also bring tatting shuttles and samples of other things I enjoy tatting. The class begins with a short introduction with the help of my interpreter. Then the students are given the instructions that have been translated in to Japanese. When they reach a technique that some may not have done before, I will demonstrate for them. Advanced tatters are paired with new tatters to help them and occasionally I will sit with them also. We have lunch 12-12:30, after lunch I talk about my display. Around 2:00 I take down my display and take class pictures. Then the class members display things they have tatted during the year and I’m asked to choose two to receive trophies. This is definitely the hardest thing I have to do because most them are very accomplished tatters. Japanese tatters are the same as tatters everywhere. 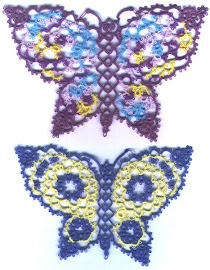 Fast or slow, young or old, they chat, laugh and enjoy tatting together. Japan is wonderful. I feel very forturnate to have this opportunity.